I understand there are some who are attempting to promulgate the false notion that Veil is not as effective against the most current police lasers. During the course of the last three weekends, I have accumulated a series of videos that demonstrate the contrary. These encounters happened in Maryland where I am finding that state troopers are now including the DragonEye SpeedLaser into the mix of police lasers used. The vehicles used in these encounters were a silver BMW 540i and a burgundy Subaru Legacy sedan. The first video of the series demonstrates how much alert warning one typically gets (using the V1) when encounters police laser without any protection. 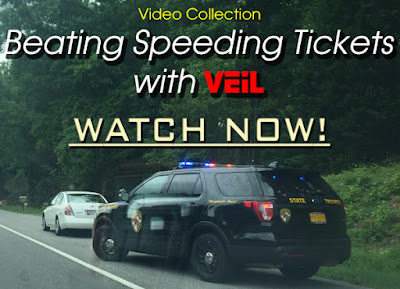 The subsequent videos demonstrate the positive effects that Veil has on protecting drivers from speeding tickets from even the latest threats.